— Julie Staeb, an investigator for the Montana Commissioner of Political Practices, referring to the possibility that nonprofit group Western Tradition Partnership illegally coordinated with Montana political candidates in 2008 and 2010. The investigation includes documents from the group that convicted felon Mark Siebel found in a meth house outside Denver in later 2010. Siebel claimed they were found by his friend in a stolen car; they were recently examined in a joint report by ProPublica and Frontline. WTP has since changed its name to American Tradition Partnership and is best known for its lawsuit that overturned Montana’s ban on corporate spending and definitively expanded Citizens United to apply to states’ campaign finance rules. Citizens United helped Mitt Romney close President Obama’s fundraising edge, according to a new report from the Center for Public Integrity and Center for Responsive Politics, but the Obama campaign was still able to take advantage of reduced ad rates for campaigns and air more commercials since late April than the Romney campaign, Republican National Committee, and seven outside spending groups supporting the GOP combined. Among all outside spending (below), Romney was the beneficiary of more than $350 million of it; Obama was supported by about $100 million in outside funds. $6 billion: The estimated total cost of the 2012 elections, according to the Center for Responsive Politics, a record amount that would top the current record by $700 million. 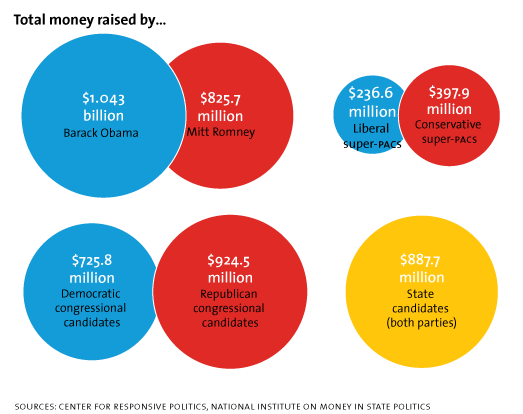 The presidential race was actually trailing 2008’s $2.8 billion by $200 million as of the end of October, but more than $500 million reported to the FEC by outside spending groups and nearly $3 billion spent on House and Senate races more than makes up for the difference. • Mitt Romney Would Be Toast Without This Man: Charlie Spies helps run the king of all super PACs — and he’s used it to keep Romney’s campaign alive. • Video: The First Silent Political Ad: Listen up! This election spot has something to say…very, very quietly.